We held an exhibition from 18th May - 22nd August 2016 of some surviving works of Edward Armitage, RA (1817-1896), the artist who painted the murals adorning the library's lecture hall. Entitled 'The Vanguard of the Age' the murals suffered deterioration in the twentieth-century and since the mid-twentieth century have been covered by wallpaper. Some of the lithographs and preparatory works have received conservation treatment under the adopt scheme run by the Library's conservator. Works in the exhibition included some of the life studies drawn for the final section of the mural. 2. 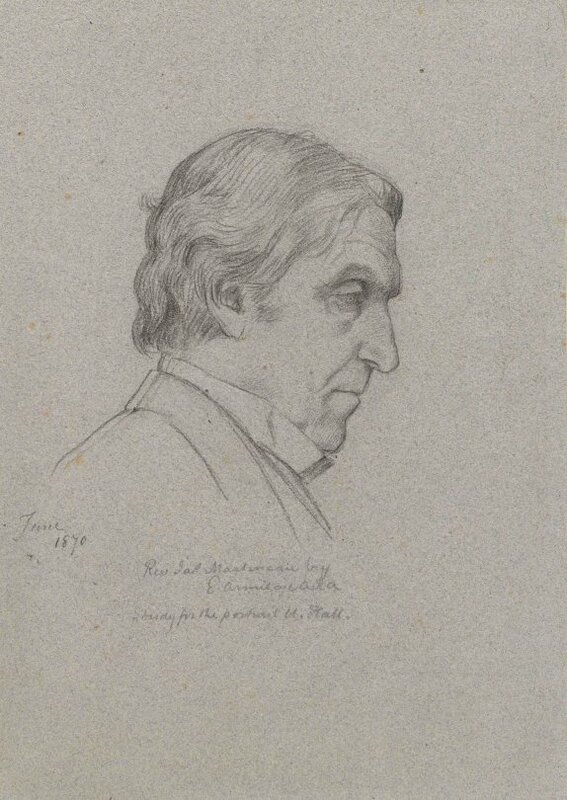 James Martineau (Pencil on blue paper). Edward Armitage was a prominent figure in the Victorian art world. He first came to notice in 1843 as one of the main prize-winners in the Palace of Westminster competitions. Queen Victoria was an early patron, and the art dealer, Ernest Gambart, commissioned him to go to the Crimea as a war artist. 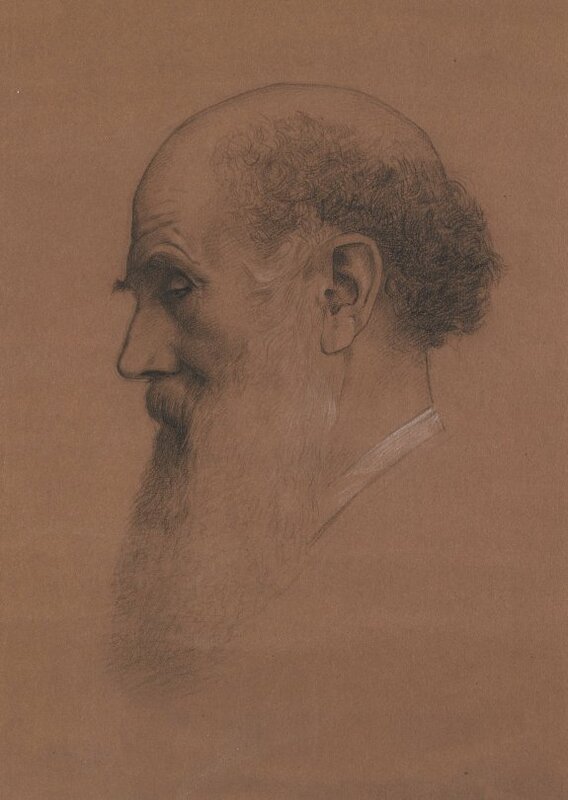 From 1848 to 1893 he was a regular exhibitor at the Royal Academy, where he was elected Associate in 1867, a full member in 1872 and in 1875 was appointed Professor of painting. Armitage was born in 1817 to a family of wealthy Yorkshire industrialists. Educated abroad, he trained at the École des Beaux Arts in Paris, where he assisted his tutor, Delaroche, with his vast fresco, L’Hémicycle. Armitage was to become a passionate advocate of fresco painting, not only in Parliament, but also in a number of London churches, often at his own expense. However, probably his greatest achievement in fresco was the mural in University College Hall (now Dr Williams's Library). The mural was in memory of Henry Crabb Robinson, who had died aged 91 in 1867 and was a founder of University College. Commissioned by Crabb Robinson’s surviving friends, it was to be on the walls of the college dining hall and was to show Crabb Robinson surrounded by his most distinguished literary and artistic friends. These included Wordsworth, Coleridge, Mary and Charles Lamb, Blake, Flaxman, Goethe, Madame de Stael and Chevalier Bunsen. Funding was by subscription, with subscribers forming an advisory committee, acting under the guidance of a number of artists. The committee nominated Armitage as the artist, selected the portraits to be depicted, and stipulated that the work should be in monochrome. Contemporary reviewers followed the mural’s progress with interest and on completion it attracted widespread praise. 56 feet long and containing 34 life-size portraits, it was considered so successful that Armitage was commissioned to include additional portraits of living benefactors, making a total of 47 portraits. To these, he added a portrait of himself in the corner, palette and brushes in hand. The entire mural was covered over in the mid-1950s but it is known from engravings, including a complete set of engravings held by the Dr Williams’s Library, who also hold preparatory sketches for the contemporary portraits.